These images now depict a day that will live in infamy in the history of British foreign policy history. A day after May left Washington—that is, on the Holocaust Remembrance Day—, Trump’s “Muslim ban” came into force, causing worldwide shock and pain. Now even her supporters had to wonder: How did we ever think we could we do business with this misogynistic, racist man? And why was the prime minister prevaricating instead out outright condemning Trump’s policy? The standard answer is cold realpolitik. Scheduled to formally take the country outside the EU’s single market in 2019, the UK government is desperately searching for new trade deals. The U.S. market is the primary target—this was implicit in May’s Lancaster House speech (“We will continue to be reliable partners, willing allies and close friends”) and and explicit in her speech at the Republican Party conference in Philadelphia (“I am delighted that the new Administration has made a trade agreement between our countries one of its earliest priorities”). Viewed from this perspective, hugging Trump close, while doing so in an extremely unedifying manner, is in Britain’s best interest—it is certainly in the best of interest of some Britons, as George Monbiot pointed out in his latest weekend column for The Guardian. Another answer is ontological security or the security of a consistent self. Building on insights in psychology and sociology, International Relations scholars like Catarina Kinnvall and Jennifer Mitzen have argued that states crave routine and secure relationships with their significant Others. This means that they sometimes comprise their objective security and prosperity—their materially defined well-being—in order to maintain a predictable self-other relationship in an unpredictable word. This could help explain Britain’s historically fraught relationship with Europe as well as its consistent support for U.S. foreign policy goals, however unreasonable these might be. Whatever the explanations, most Conservatives and probably at least a third of the British voters are in quiet support of staying the course. On the same day Trump’s press secretary giggled about the need for an ever closer special relationship. William Hague, former British foreign secretary and no supporter of Brexit, penned in The Daily Telegraph that the special relationship was Britain’s only “indispensable alliance.” Subsequent events did little to make him change his mind. Rather than retaliating against Trump’s policies—which is a minority demand anyway—the UK government should host the American president this summer as planned. As for the image of the queen being “within grabbing distance of America’s helmsman,” Britons would do well to recall that she has dealt with thugs before, wrote Hague on January 31. The special relationship has always been asymmetric, with the Americans acting as rule-makers and the British as rule-takers. That said, rules have never before been made by Stephen Bannon, the American president’s “chief strategist.” Having likened himself to revolutionaries such as Lenin and Thomas Cromwell (and also figures like Darth Vader and Satan) Bannon appears to be bent on remaking international order by moving the US away from “multilateralism”, “liberalism” and “democracy” and towards America First-styled “sovereignty” and “traditional values.” In practice, this means that the US is now openly hostile to the UN, WTO, NATO, the Five Eyes, to say nothing of the fragile global governance regimes on climate, human rights and arms control—while simultaneously being “open-minded” about Putin’s Russia and Europe’s far right. Caspar Friedrich’s Wanderer—the Alt-Reich loves this guy as much as the other Reich did. 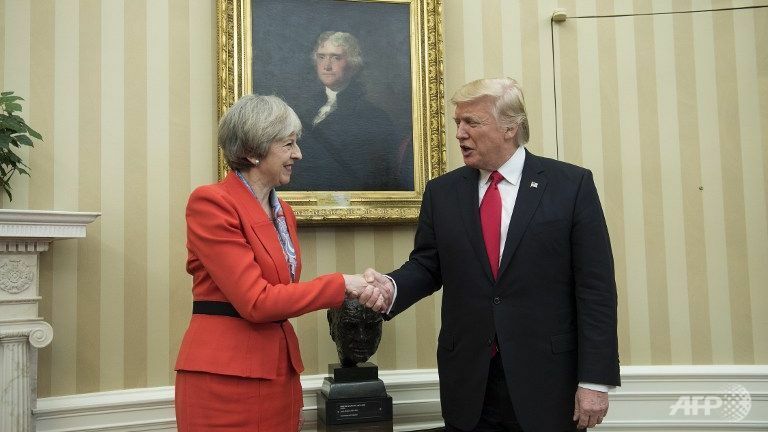 In every generation for the past seventy years there were those who saw the special relationship as a Faustian bargain for Britain. Their arguments usually never made it into the mainstream, however. Not so last week—compare the aforementioned Monbiot or Paul Mason in The Guardian to Gideon Rachman in The Financial Times, for example. Today, as thousands of Londoners surround the US embassy under the banner “Make America Think Again,” it is worth asking where May’s Trump policy might take Britain in the end. Among several memorable statements the prime minister made in her Philadelphia speech, one that received no media scrutiny was the claim that the UK and the US together “defined the modern world.” Not a diplomatic thing to say, but not necessarily wrong either. The British Empire, in its many forms and iterations, transformed the globe by making Britain and “Neo-Britains” rich, and those on the outside poor. Britain also never challenged the rise of the U.S. the way it challenged other imperial rivals—before the democratic peace came the Anglo-Saxon peace. And once the US moved to establish the so-called liberal international order after World War II, a special role was reserved for Britain. “Whenever we want to subvert any place, we find the British own an island within an easy reach,” said one American spook in 1952. The statement has aged well—it helps explain British foreign policy after Suez, after East-of-Suez, after the end of the Cold War and after 9/11. It may well be valid in the Trump era as well, albeit this time the island in question is likely to be Britain itself—Oceania’s “Airstrip One,” as depicted by Orwell in 1984.